How can this UI be simplified for the user? In the search box, state that the user may search users or roles. Do not present any other choices at this point. When the user enters a search query, present the appropriate choices. When the user makes a selection, for example "UX Designer", clearly state the associated role. Offer a button to assign that role to the current user. A search query may return both Users and Roles, and that's fine. To enhance further, consider visually distinguishing users from roles -- for example add (Role) and (User) in parenthesis. If a User is selected, their role is displayed -- i.e. the behavior is consistent with scenario 3. Thanks for the screen shots. Looking at the images initially gave me a sense of anxiety and ambiguity. If you decide to keep this feature the way it is, then move the options to the top of the search box since they determine what the search box does. Without context I feel as though the 'Copy assignments' is quite different from 'Add role'. My advice would be to test a design where the search box only allows users to Copy user assignments. 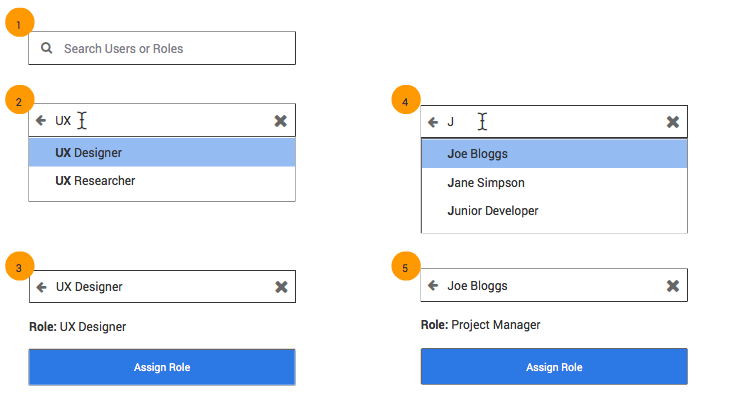 Then, for adding roles create a separate section that allows the user to view all the roles available and select the roles they want to add. The issue I see with 'Copy user assignments' is do users know all users or the users that they want to copy assignments from? Not the answer you're looking for? Browse other questions tagged search controls administration or ask your own question. Text in a search field - selected with one click or not? Search field with or without a button?